Channel swimmers either cross the Catalina Channel or the Santa Barbara Channel (four northern islands). The first officially documented crossing of the Catalina Channel occurred with George Young in 1927. 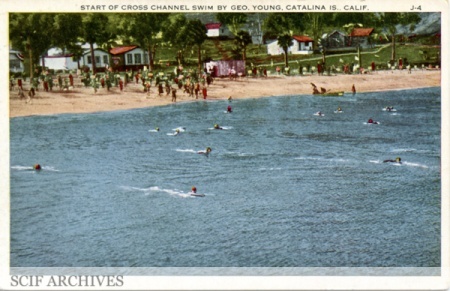 The first crossing of the Santa Barbara Channel (non-Santa Catalina Island swim) by a swimmer was by Cindy Cleveland of Santa Monica in 1978 who swam round trip, followed by Dave Yudovin of Cambria who crossed one way in both 1982 and in 1983. Triple Crown swimmers have successfully completed three swims: (1) across the English Channel between England and France, (2) across the Catalina Channel between Santa Catalina Island and the Southern California mainland in the United States, and (3) the Manhattan Island Marathon Swim, a 28.5-mile circumnavigation around New York City according to the World Professional Marathon Swimming Federation. Five people have successfully swum from the Farallones to the mainland, either to the Golden Gate or to points north of the Gate. The first, Ted Erikson, made the swim in September 1967, with the second, Joseph Locke, swimming to the Golden Gate on July 12, 2014, in 14 hours. The third person, and the first woman to complete the distance, Kimberley Chambers, made it in just over 17 hours on Friday August 7, 2015.